NASA astronaut Ricky Arnold works on gear inside the International Space Station. The Expedition 56 crew members continued their work Friday on more fertility research and microbe studies aboard the International Space Station. They also worked on science gear for a study seeking advanced therapies for diseases such as Alzheimer’s and diabetes. Commander Drew Feustel and Flight Engineer Serena Auñón-Chancellor examined biological samples for the Micro-11 fertility study. They looked at the samples through a microscope which were later stowed in a science freezer. The experiment seeks to determine if human reproduction would be possible off the Earth. Feustel also spent some time in the morning working on the Amyloid experiment to help doctors develop advanced treatments for Alzheimer’s disease and diabetes. He collected amyloid fibril samples from the Cell Biology Experiment Facility and stowed them in a science freezer for spectroscopy and microscopic analysis back on Earth. 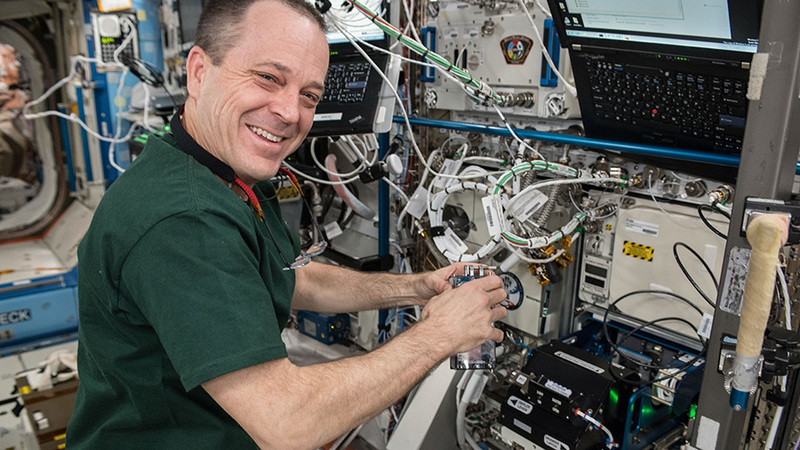 European astronaut Alexander Gerst and NASA astronaut Ricky Arnold were sampling the station’s atmosphere and surfaces for a pair of microbe investigations today. Gerst collected microbe samples and stowed them in a freezer for molecular analysis on Earth to identify potential pathogens on the station. Arnold processed microbial DNA using the Biomolecule Sequencer, a device that enables DNA sequencing in microgravity, to identify microbes able to survive in microgravity. Couldn’t be a coincidence! The scene you described made the hair on the back of my neck quiver. I think that the coyote packs sensed information not accessible to humans. The only thing missing here is a recording of your coyote friends. Next time? Thus is wonderful info, thank you, some of us need input. Always amazed to know people are on board during my viewing of the fly by. I teach Earth Science in a North Carolina high school and would love to have my students communicate with ISS astronauts via a blog. Is that possible through this site? Interesting reading ,Thank you to all of the astronauts working for NASA!